CHRISTMAS… the weather has turned a little frosty and there might even be snow on the ground. (if you are lucky!) If you live in a warmer climate, don’t worry about it because as soon as you put on some Christmas music to set the mood and start to unpack those Christmas decoration boxes you will definitely get into the holiday spirit! After Thanksgiving, I pack up all the fall decorations and the boxes are stored down in the basement. Then, my husband brings up the Christmas decorations and it can take awhile because I have several boxes! The process of decorating our house for Christmas can take several days but I enjoy every minute of it! The interior house Christmas decorations I have collected over the years are not specific to a certain room and I can be creative with the different accessories, so I’m not limited to the same decorations in the same place every year and this keeps things interesting and fun! I have fewer exterior house decorations and generally they are the same every year. For the last couple of years we have decided not to decorate the outside of the house with lights to save both time and money – please don’t call us Scrooge!! Like most holidays when I start the decorating process for the holiday season, I begin with setting up the Christmas decorations outside on the front porch. Living in the Midwest the weather conditions can get very harsh and I usually keep all my exterior decorations under the roof of the porch to keep everything safe from the elements. I start with a couple of pre-lite artificial Christmas trees and for the last couple of years I have added a pre-lite snowman bought at a Target after holiday sale. I liked the size of the snowman but embellished him a little by gluing on larger black buttons, topped it off with an old black winter hat and this year I’m going to change the wire nose and add a large artificial carrot instead! To complete the front porch, I hang a Christmas wreath on the front door. I have three different wreaths that I rotate from year to year. One is a large pine wreath decorated with pinecones and red berry sprays, another is a wreath covered completely in velvet holly leaves and the third one is a pine cone wreath accented with holly leaves and red berries. The last room on the main floor of the house to decorate for the holidays is the kitchen. Now, this can get a little tricky because the room needs to function as a full service kitchen, so the counters need to stay clear of decorations because food and meals are being prepared and eaten at the table on a daily basis. We have a fairly large kitchen that is open to the family room and these two rooms of the house are where we spend most of our time. Several years ago I found the perfect Christmas theme for the holiday decorations in the kitchen – gingerbread and candy canes!! Since there are several areas in the kitchen that I decorate for Christmas, I start with an area that has a long chair height counter with upper and lower cabinets. This is the area my daughter does her homework and the counter needs to stay free of clutter. So, in the space above the upper cabinets I usually set-up a Department 56 gingerbread train that is displayed with pine boughs, red berry sprays and this year I have added “white icing” snowflakes to give it a different look. 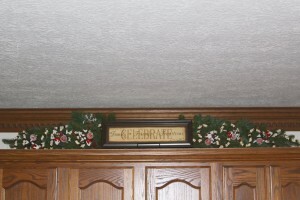 I also hang two holly wreaths with red berries and gingerbread snowflakes on the cabinet doors. The last area that needs some Christmas attention is the area by the stove and oven. Please be careful with the holiday decorations in this area because with the extreme heat from cooking you don’t want anything that is flammable or a fire hazard. 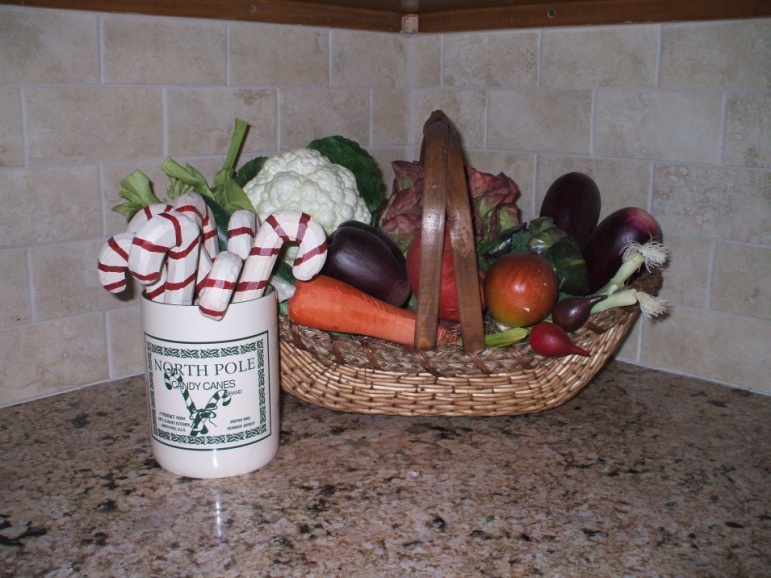 I have a basket of artificial vegetables on the counter and I add a cute “North Pole Candy Canes” container that holds some wooden candy canes and pine sprays. I also hang some Santa towels from the oven bar handle. I hope you enjoyed the tour of our house decorated for the holiday season and I try to create decorations that are classic and traditional but fun and interesting. Please let me know your comments or suggestions; I would love to hear what you think. 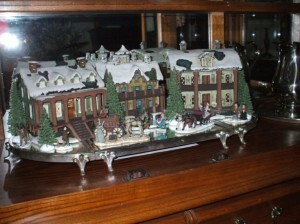 This entry was posted in Decor and tagged Barbara Jones, Boyd's Bear, Boyd's Bear decorations, Boyd's Bear display, Boyd's Bears Village, Candy Cane decorations, Christmas Decorations, Christmas Home Decorations, Cranberrry topiary, Currier and Ives porcelain houses, Decor, Decorating a house for Christmas, Department 56 North Pole Village, Enchanted Manor, Fall Victorian Centerpeice, Fontanini Nativity, Kitchen Christmas decorations, sled and antique skates, The Enchanted Manor by barbara. Bookmark the permalink. So let me talk about the transformation of our house from a guy (the husband’s) perspective. First, “several” boxes of Christmas decorations is somewhat of an understatement. 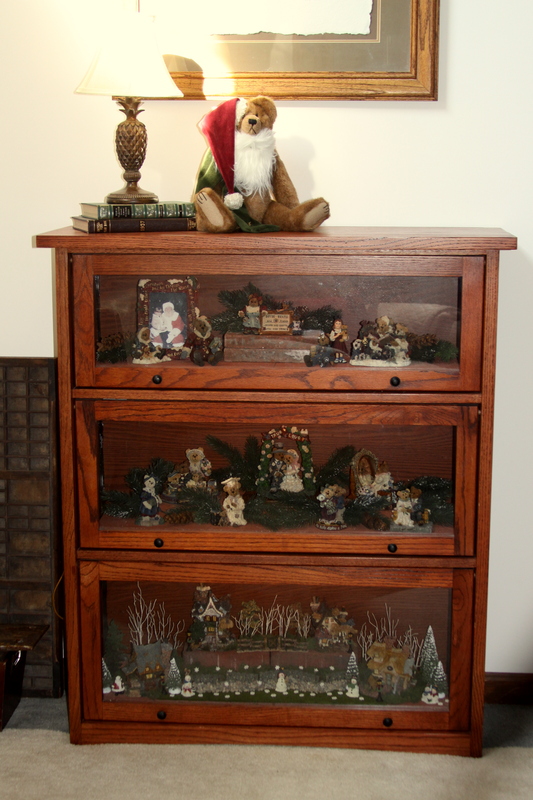 Christmas is Barbara’s favorite holiday and “several” is 9 large plastic tubs and 2 huge ones. Yes, I can confirm it takes a bit to get everything out, but it worth it! 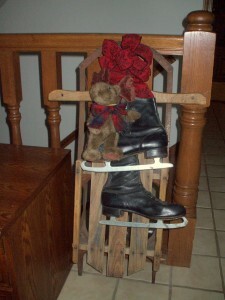 Barbara mentioned the big ticket items she does every year, but it is the smaller things that really get our family into the mood. Towels magically switch out to Christmas themed towels. At some point a small Star Trek tree appears in my office. Usually Cassanda gets a tabletop themed tree in her bedroom. Somehow Santas, Reindeer, garlands, pine sprigs, berries appear everywhere you look. It is subtle, but that makes it all the more magical. I will take all the blame for the Scrooginess of our outside. I used to go all out in decorating our house in California. Then one year electicty prices went through the roof and I started boycotting outside Christmas lights. I have my own boxes (yes, plural) of Christmas lights and maybe it’s time to start putting them out again. I also used to love going shopping the day after Christmas every year to find light on sale. Maybe its time to invest in the new low power LED lights. Going back to the decorations, Barbara gives all of herself to make the Christmas season wonderful for everyone and we really appreciate it!